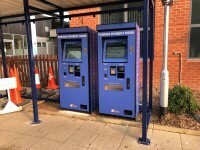 You are on Getting To (Ward 7B). Skip to the next section. 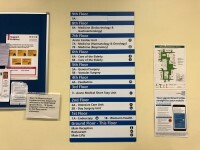 Ward 7B is/are located on level 7 of Tower Block. 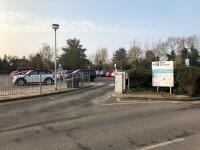 Access to Ward 7B is via the main hospital entrance. 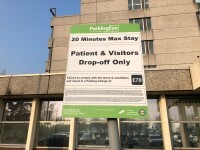 Enter via the main entrance and proceed to the right past reception. 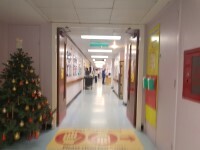 Continue down the main corridor until you reach the shops and take a left into the main lift area. 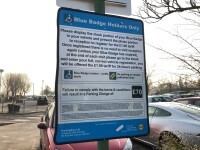 Take the lift up to level 7. 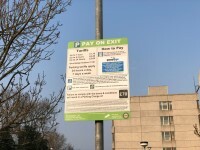 On exiting the lifts turn right and Ward 7B is located on the left. 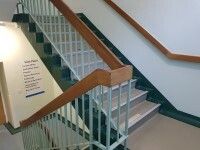 There is step free access, via lift, to Ward 7B. 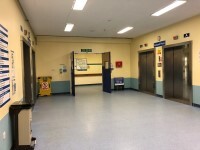 Ward 7B is approximately 8m from the Tower Block lifts. 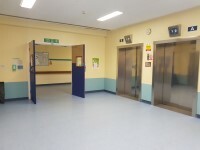 There is flooring in corridors with a very shiny finish which could cause issues with glare or be perceived as slippery. 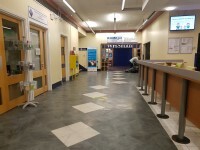 There is flooring in corridors with large, repeating patterns that incorporate bold contrasting colours or simulate steps. 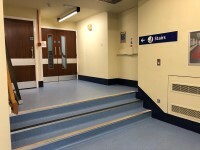 The floors which are accessible by stairs are G, 1, 2, 3, 4, 5, 6, 7, 8, 9. 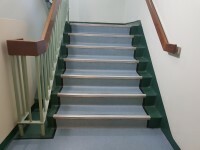 The stairs are located along the front right corridor as you enter via the main entrance. 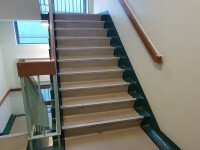 The stairs are approximately 13m from the main entrance. 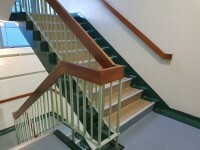 There are 3 deep steps with handrail on the left to access the stairs on the ground floor. 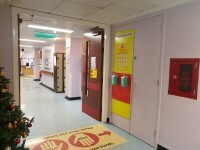 The lift is located in the main hospital corridor, to the front right as you enter via the main entrance. 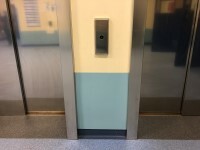 The lift is approximately 32m (34yd 2ft) from the main entrance. 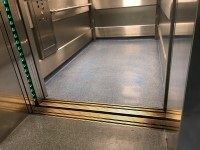 The floors which are accessible by this lift are G, 1, 2, 3, 4, 5, 6, 7, 8, 9. 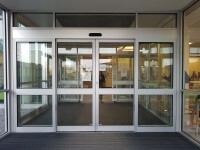 The clear door width is 131cm (4ft 4in). 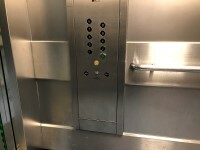 The dimensions of the lift are 153cm x 255cm (5ft x 8ft 4in). 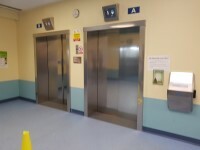 There are 4 similar lifts in this area. 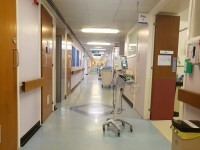 This is a/an respiratory medical ward. 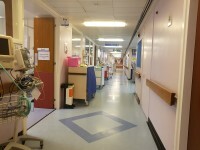 There is flooring on the ward with a very shiny finish which could cause issues with glare or be perceived as slippery. 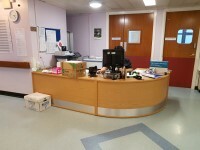 The height of the ward reception desk is 56cm. 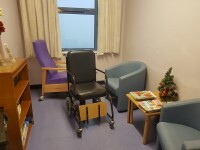 There is not a relatives room for the ward. 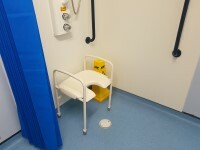 There are accessible washroom facilities with a wheel in shower for patients on the ward. 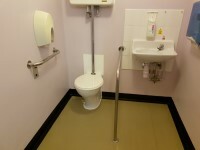 Accessible toilet facilities for visitors are located just inside the Maternity Block. 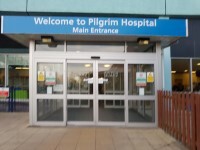 Standard toilet facilities for visitors are located in the hospital main foyer. 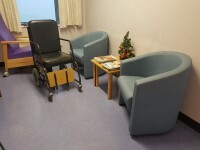 You are on Room / Area (Day Room). Skip to the next section. 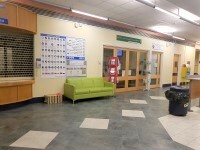 The dimensions of the washroom are 201cm x 234cm (6ft 7in x 7ft 8in). There is a/are coat hook(s) 132cm from the floor. The height of the wash basin is 81cm. The height of the soap dispenser is 113cm. 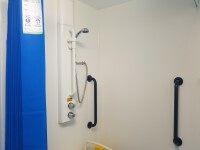 The height of the towel dispenser is 116cm. The lateral transfer space on the left is 113cm. 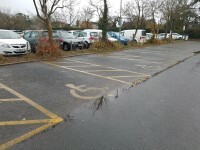 The lateral transfer space on the right is 148cm. 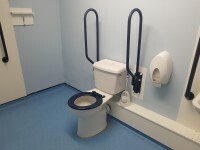 There are no wall-mounted grab rails for the toilet. 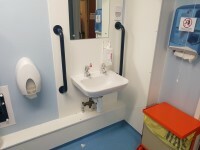 The height of the toilet roll holder is 113cm. 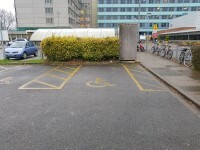 The nearest accessible toilet is located just inside the Maternity Block. 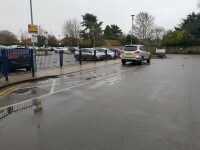 The shared toilets that were surveyed are located at the rear of the ward.